Like any Southerner, we at Southern Kitchen love traditions, especially those created right here in the South and passed down and around for generations. So it was only natural that we started wondering about the story behind the South’s favorite carbonated drink — Coca-Cola. We’ve talked about the best ways to enjoy it — commandments exist — and shared several recipes made better with Coke, but we wanted to know more about the different flavors of the drink. The Coca-Cola Company’s journey began in the late 19th century. In 1886, amid racial and labor unrest in the United States, a man by the name of John S. Pemberton introduced to the beverage scene a carbonated drink that would grow to define rest, relaxation and refreshment in the South. 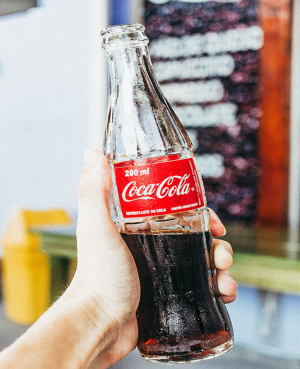 Coca-Cola, named later by Pemberton’s partner Frank Robinson, is today an instantly recognizable brand with numerous flavors around the world, but the dark, fizzy original cola has remained the South’s preferred drink since its roots were planted in Atlanta, Georgia all those years ago. 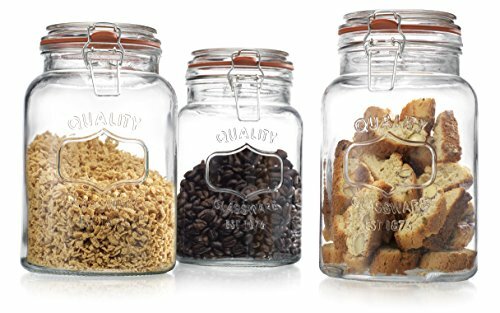 Today, the company boasts brands like Fanta, Sprite, Minute Maid, Simply and Dasani, which together effectively cover almost every type of beverage. Still, just seeing the name Coca-Cola paints in our minds a picture of its distinct, contour glass bottles and cheery, red cans emblazoned with white script logo, and composes in our ears the bright pop of a cap or tab and the pleasing fizz of carbonated bubbles that follows. Take a sip of Coke today and you’ll taste a little bit of vanilla mixed with a sprinkling of spices like nutmeg and cinnamon, and a light hint of citrus underneath the sweetness. 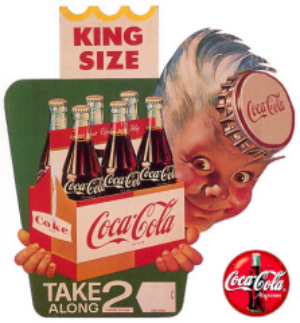 The formula behind Coca-Cola’s marked taste was billed as a heavily guarded secret enveloped in a mystical aura similar to that around folklore and childhood fairy tales. All anyone could offer were educated guesses based on rumors. The recipe ingredients remained a compilation of scholarly and conspiratorial guesses until 2013. That’s when writer and freelance journalist Mark Pendergrast released his book, For God, Country & Coca-Cola: The Definitive History of the Great American Soft Drink and the Company That Makes It, which contained photos of an early recipe penned in Robinson’s handwriting. Pemberton’s original recipe had been doctored slightly by Robinson and Asa Griggs Candler, The Coca-Cola Company’s founding president. 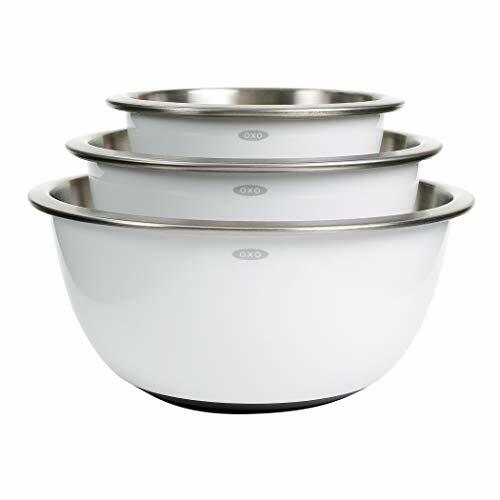 However, many of the original flavor notes, like vanilla, nutmeg, cinnamon and citrus oils, stayed in the recipe. The secret was out, with little fanfare over possible copycat recipes arising from the printed recipe. It wasn’t just because the Coke brand had essentially commandeered the distribution world and our taste buds; Coke’s closest rival had already been around for a century. Founded just over a decade after Coca-Cola’s release, PepsiCo had crafted a cola-flavored soft drink similar to Coke’s, except sweeter and with a dryer flavor profile. Pepsi grew alongside Coca-Cola, producing sports drinks, tea, water, juice, and becoming the second largest producer of cola flavored soft drinks in the country. Almost neck and neck with Coca-Cola in popularity and yearning to surpass it, PepsiCo came up with the Pepsi Challenge in 1975, meant to prove that Americans prefer Pepsi to Coke. The challenge was simple — Pepsi representatives set up tasting stations around the United States. Two plain cups were presented to people, one containing Pepsi and the other containing Coke. Based on just a single, blind sip from each, participants picked their favorite drink. It seemed to be a success for Pepsi. Until 2005, when author Malcolm Gladwell revealed a flaw in the test — people would always prefer the sweeter drink (Pepsi) based on a single sip, even if a less sweet drink overall (Coke) would prevail if tasters drank a full can. In the next decade, as competition rose between Coca-Cola and its competitors, the gap between company profits dwindled. Coca-Cola set out to re-energize its brand. TaB, a Coca-Cola brand of diet sodas without the “diet” or Coke name, had been on the market since the 1960s, and Diet Coke had been on the market since 1982, but Coke wanted to explore changing up its classic recipe. 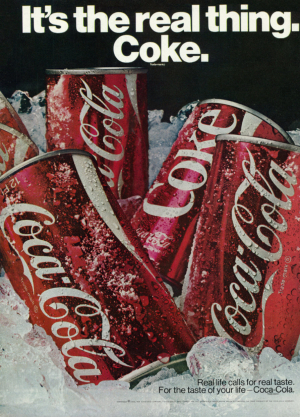 In 1985, Coca-Cola rolled out “New Coke,” a re-formulation of its original taste. Early taste tests gave proof most people preferred new Coke to the original flavor. But when Coca-Cola began selling and marketing new Coke, the outcry against changing the original formula — one people had grown to associate with home, rest and relaxation — was so strong, Coca-Cola’s original flavor had to make its return, and new Coke was no more. 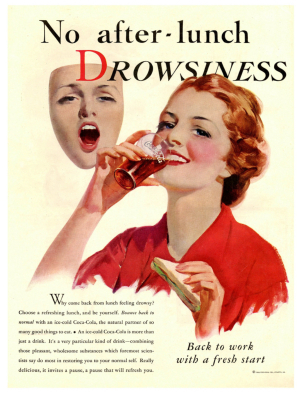 After re-establishing itself as the premier cola drink on the home shelf and on the consumer’s mind, Coca-Cola’s focus turned to adding complementary fruity and mellow flavors to its original cola taste. We rounded up all the flavors that sprang off the original Coca-Cola and presented them below in a timeline. Released as a limited time drink to celebrate the Olympics held in Beijing. Vanilla coke went away in 2005, much to fans’ dismay, but came back in 2007. Now available in Coca-Cola Freestyle machines. This flavor was a citrusy Diet Coke only available outside the United States. In early 2018, Coca-Cola released its equivalent, Diet Coke Zesty Blood Orange, in the United States and Canada. This flavor was released in New Zealand in 2006, went away in 2009, and was re-released in 2017, now available in Freestyle machines. This flavor was available for a limited time outside the United States. Now available in Freestyle machines across the country. This flavor is only available in Australia. Coca-Cola’s first alcoholic drink released in Japan. This clear, zero calorie version of Coca-Cola was released in Japan. Early 2018 saw a slew of new, sprightly named Coca-Cola flavors. The soda market had shifted. Audiences, particularly the younger audience, now preferred less sweet sodas and clearer ingredient lists. Satisfying this shift in preference were fruit-flavored seltzer waters like LaCroix and locally-made, small batch craft sodas found in hometown markets. 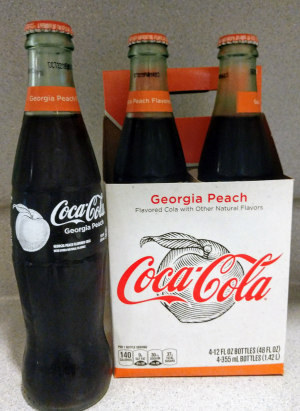 Coca-Cola picked up on this shift in preferences and released several bright and fruity Diet Coke drinks, followed by regional craft soda flavors Georgia Peach and California Raspberry. 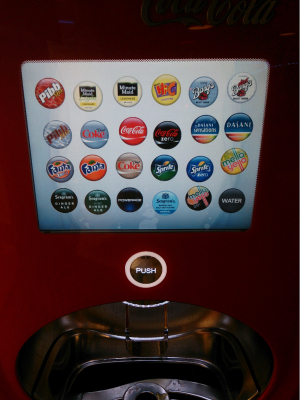 Today, most of Coca-Cola’s fruity flavors live on in Coca-Cola Freestyle machines, touch screen soda fountains released in 2009 around the country that can dispense 165 different Coca-Cola brand drinks and custom flavors. Whether you prefer the classic, unchanged cola recipe in a contour glass with a couple of peanuts popped in, or if you enjoy going on a fruity, flavor adventure using a Freestyle soda machine, Coca-Cola will always have a place in the hearts of Southerners and on our fridge shelves. 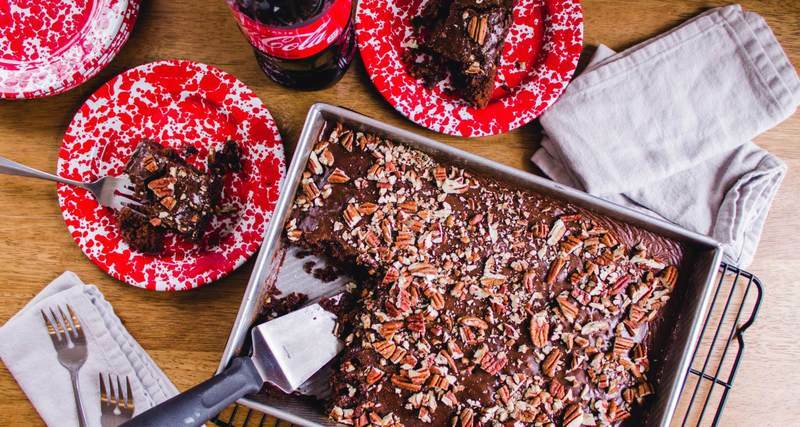 Want to cook with Coca-Cola?